We caught up with Gretsch Drums Brand and Artist Relations Manager Andrew Shreve to talk Gretsch drums and to find out what exactly he is looking for in a Gretsch endorser today. It was a chance meeting back in the early 90s in a Manhattan restaurant when Italian twin brothers Simone and Amadeo Pace first met Japanese guitarist and singer Kazu Makino. From The Army to New York’s Village…and Beyond. Here’s a story that proves you don’t have to be a superstar to have a remarkable drumming history. When Ash Soan turned 19, he, like the rest of us, realized that he was never going to be Vinnie Colaiuta. Yet unlike the rest of us, Ash stayed committed and forged a unique playing style that has landed him jobs with the likes of James Morrison, Billy Idol, and Adele. Along with the rest of the music world, everyone at Gretsch is saddened by the passing of Dominic Joseph “D.J.” Fontana this past Wednesday, June 13. But we also want to celebrate two wonderful things about D.J. Karl Brazil has struck that perfect balance that you will often find amongst A-list drummers. They are fun to be around in those gloomy 4-hour delays at the airport, but when it comes to laying down the groove, whether on stage or in a recording session, there is no more joking about. It’s this very professionalism and adaptability as a player that has landed him top level gigs with the likes of Robbie Williams, James Blunt, and countless others, making him one of the busiest session drummers in the UK. By January 1986, I, like the rest of the world, had watched a-ha’s Take On Me video and had been completely enamored by the story line, the panic of being chased by Nazi-like bad guys, and the fight for love! Fred #3: Fred Gretsch, Jr. – Guiding The Golden Age of the 50s and 60s. Fred Gretsch, Jr., representing the third generation of “President Freds,” was born on March 10, 1905. His father, Fred Sr. must’ve been proud that his first-born was a son who would someday follow in his footsteps. Fred #2: Fred Gretsch, Sr. – The Visionary, Teenage CEO. If you had a time machine and attended any Gretsch family reunion in the past 100 years, you’d probably meet more than one Fred Gretsch. Enjoy part two of this special interview with drummer Mark Schulman. Mark discusses what he likes about Gretsch drums, his best and worst concert experiences, his work as a motivational speaker. For most music industry insiders, Gretsch drum artist Mark Schulman is a man that needs little introduction. Over the past three decades he has played on stages the world over touring with the likes of P!nk, Cher, Simple Minds, and Billy Idol. Jason McGerr is a recent Great Gretsch drum artist, having come on board just last year. But he’s certainly no stranger to the drumming community. His work as a member of internationally known Death Cab For Cutie has cemented his reputation as an innovative and musically creative drummer. Nathaniel Townsley is a relatively new Gretsch Drums artist, having joined the roster in 2016. But he’s certainly not new to the drumming scene. In fact, Nathaniel has earned a reputation as a “quiet giant” among knowledgeable drummers who’ve followed his amazing career over the past two decades. What makes Mark a Great Gretsch Educator is the way he shares his information. Instead of claiming to have a secret formula for success or a quick way to get good, Mark simply lays out the practice methods that he himself used to achieve his unique voice on the drums. He doesn’t suggest that you learn to play exactly like he does; he simply suggests that you might benefit from studying the way he learned to play that way. Matty is a multi-threat artist. In addition to his drumming skills, he’s a talented guitarist and bass player, a record producer, and a skilled audio engineer. And you can add to that list the role of highly motivational educator, eager to share his knowledge and experience. A record-breaking event of historic magnitude deserves nothing less than a “one night only” film screening at thousands of cinemas around the world. The film Havana Moon was shot during The Rolling Stones’ March 25, 2016 concert in Cuba—which was attended by an astonishing 1.2 million adoring fans. Fred W. Gretsch, fourth-generation leader of a family business that has helped shape American music history, was presented with an honorary Doctor of Music degree from Elmhurst College at the school’s Spring Commencement on May 28, 2016. One hundred years later, I think my grandfather would be proud that the factory he and his family built in 1916 has survived and is still a vital part of the Williamsburg community. 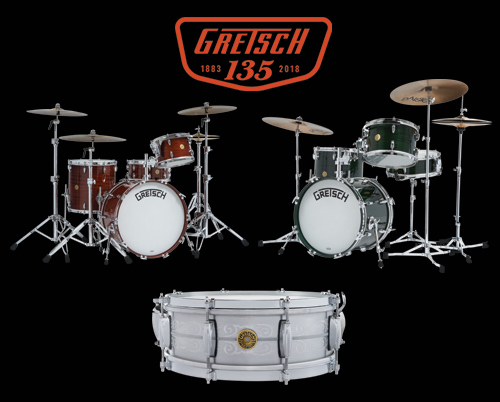 Read more about A New Gretsch Drum Website is a Time For Celebration!